Children ages 12 and under and their families are invited to the park for an afternoon of family fun. Activities will include an egg hunt, children’s crafts and much more. This FREE event will provide excitement for kids and adults. It’s an afternoon of trout fishing for children ages three through fourteen! The Derby is free to the public; in addition, there will be games and food. It’s opening day at the Fayette County pool! Register to win a free summer gift bag! Calling all seniors! Now is your chance to enjoy some pool time; don’t miss out! 6:00 - 8:00 PM $3 pp. 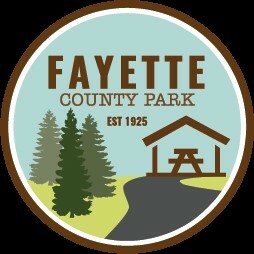 Fayette County Park is celebrating Parks & Recreation month with the following special offers:, reduced pool admission fee ($2.19) on July 1, 11, 18 & 25. Buy one custom disc (for disc golf) and receive a free mini disc on July 12,13 &14. On July 19 the first 19 customers at the Canteen receive a free ice cream. Visit the canteen on July 26 & 27 and receive a free bag of popcorn. Join Active Southern WV for the 4th annual Ugly Sweater Walk/Run. This event is the exclusive first night of the Winter Wonderland Light Show and open to event participant foot traffic only. $10.00 per person, $5.00 for 12 & under. See the park come alive with our Christmas ligthing on December 1st, The lights will be on each evening through December 30th from 6:00 PM – 10:00 PM. Gate admission is $5 per car.